Still frames from the FX1. Camera Weight important for choice of heads, jib arms etc. 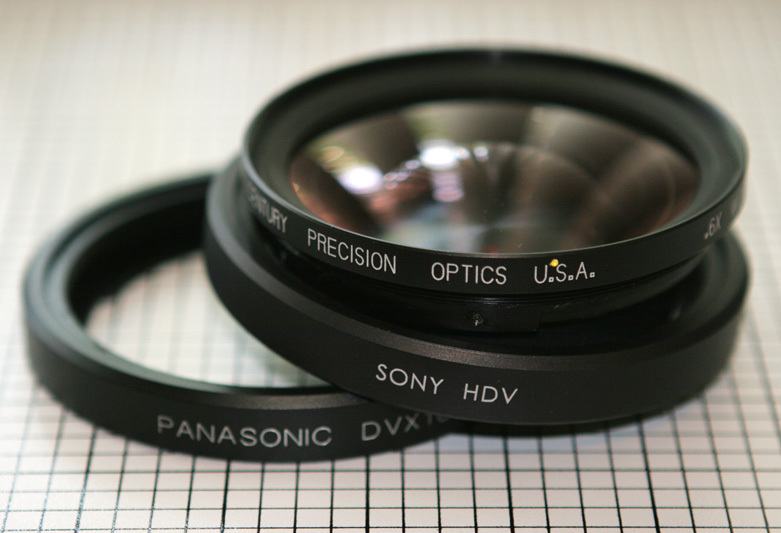 Century Optics makes a 0.6 wide-angle lens (limited zoom-through) for several cameras including the Panasonic DVX100 and the Sony FX1/Z1U. 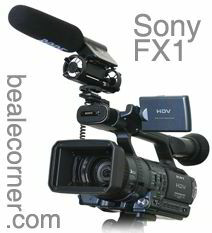 I had the DVX100 model, but the only difference between that and the FX1 is a slightly different bayonet attachment ring. 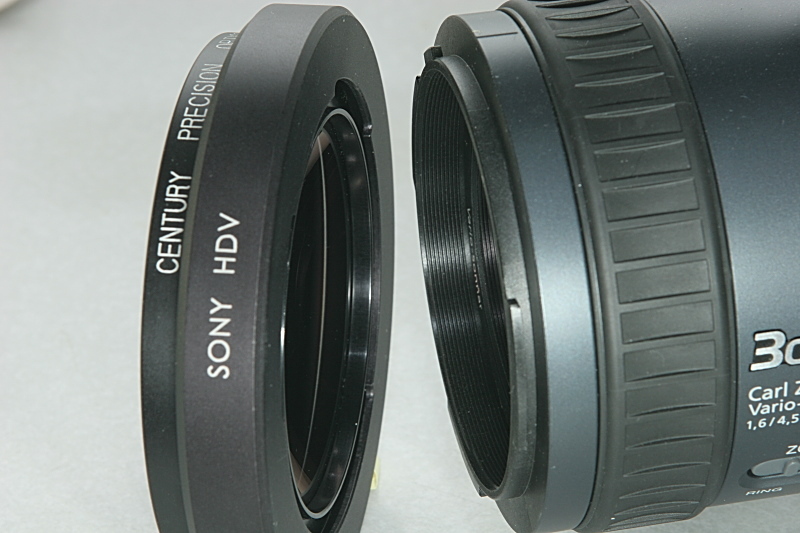 You can purchase just the adaptor ring from Century for $100, which is quite a bit cheaper than the full lens assembly. By releasing a setscrew, you can unscrew one bayonet-mount ring and replace it with the other model. Here's some photos of the adaptor: two rings, and assembled, and mounting on the camera Cent-FX1a, Cent-FX1b, Cent-FX1c. Here are some still frames that compare the view with and without the 0.6 wide lens. With the wide lens mounted, the FX1 focus distance scale is not accurate: the indicated distance is 0.1 to 0.2m for all subject distances. This lens is not "zoom-through". 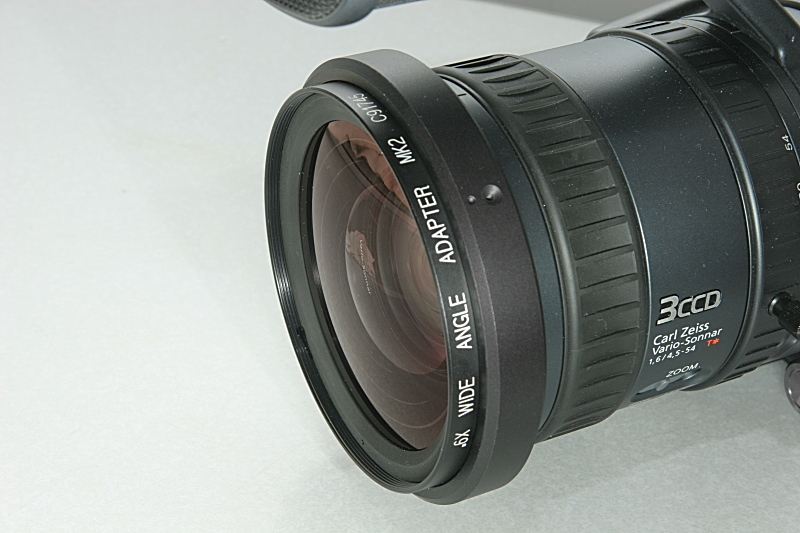 It works at indicated focal lengths from 4.5 to 17 mm, but looses focus beyond that. The focal length on FX1 and Z1U cameras is 4.5 to 54 mm for a horizontal field of view ranging from 58 degrees to 5.3 degrees. The equivalent 35mm SLR lens lengths are 32.5 to 390 mm. 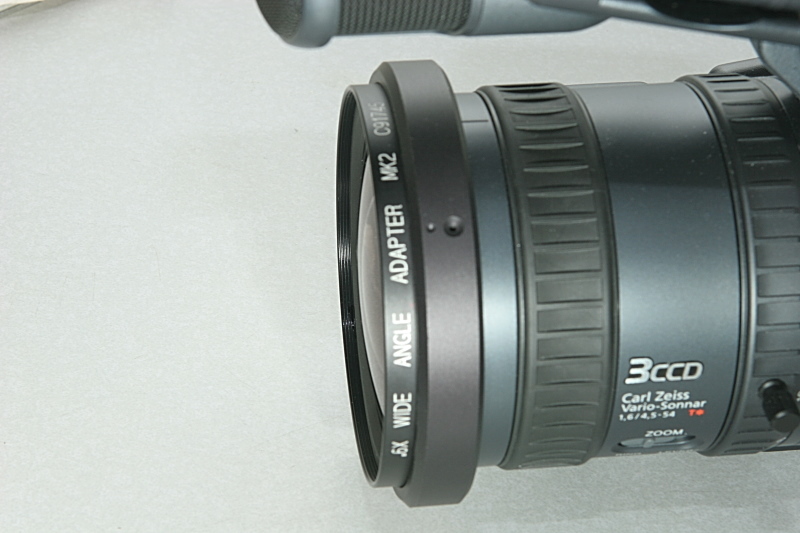 This is a 12x zoom range but you can use the only first 3.8x of that zoom range with the Century 0.6x wide-angle lens attached. 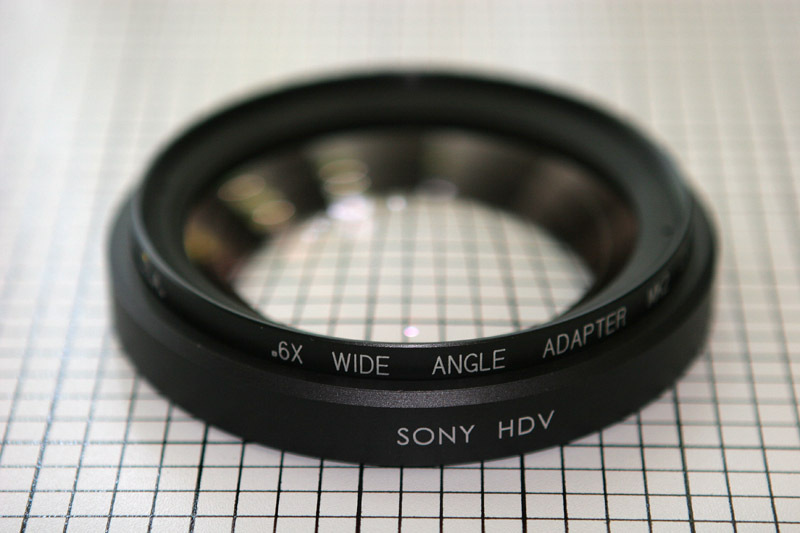 With the 0.6x adaptor, the maximum horizontal field of view is 85 degrees, equivalent to a 20 mm lens on a film SLR. I found the Rode Videomic to be have useful directionality and reasonably low internal noise. I have used it as a backup to a lapel-mounted mic and minidisc for capturing sound at a wedding ceremony, and it has performed adequately. It has a 1/8" miniplug output which matches the FX1 mic input. As far as I know it is the price-performance leader at this point for camera-mount directional microphones; the other directional mics in this price category are more noisy. I did not observe any problem when using this microphone with the FX1. When used with the VX2000, I heard some clipping on loud music and when the audience was making a lot of noise. 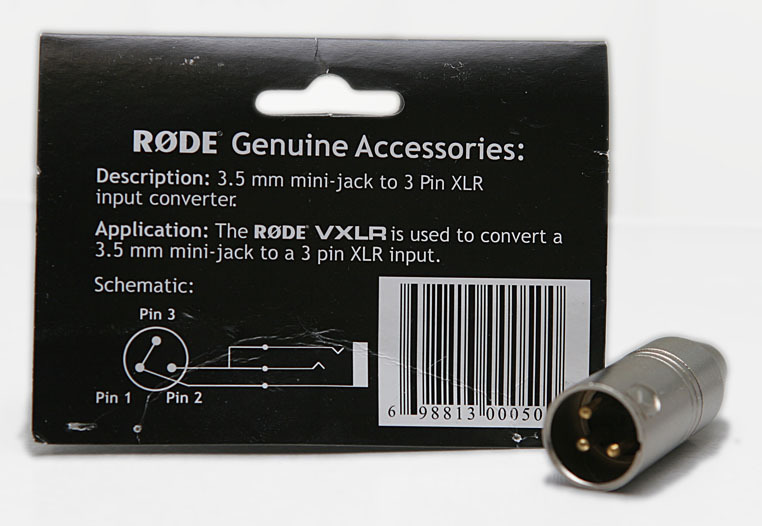 You can use the Rode VXLR adaptor to connect this mic to an XLR input. This does no impedance matching, just XLR to mono minijack, with XLR pins 1 and 3 going to miniplug shield, and XLR pin 2 going to miniplug tip and ring. Here is the VXLR internal connection. Stock FX1 with F970 battery and 60 minute MiniDV tape: 2.394 kg. Rode mic: 202 g. Bracket1.com bracket: 265 g. Studio-1 XLR-PRO: 282 g. ECM MS-908C mic: 96 g. Senn EW100 G2 rcvr. w/2AA: 189 g. All of the foregoing: about 3.5 kg (about 7.5 pounds). Century 0.6 wide adaptor: 253 g.
One advantage that the more expensive Sony Z1U has over the FX1 is professional XLR-type audio inputs. 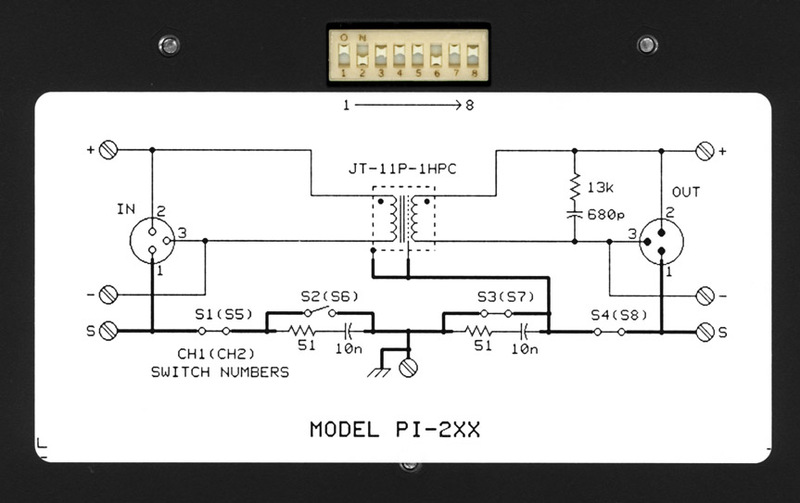 If you just need line-level balanced inputs (not phantom power for mics) you can use a passive transformer box. 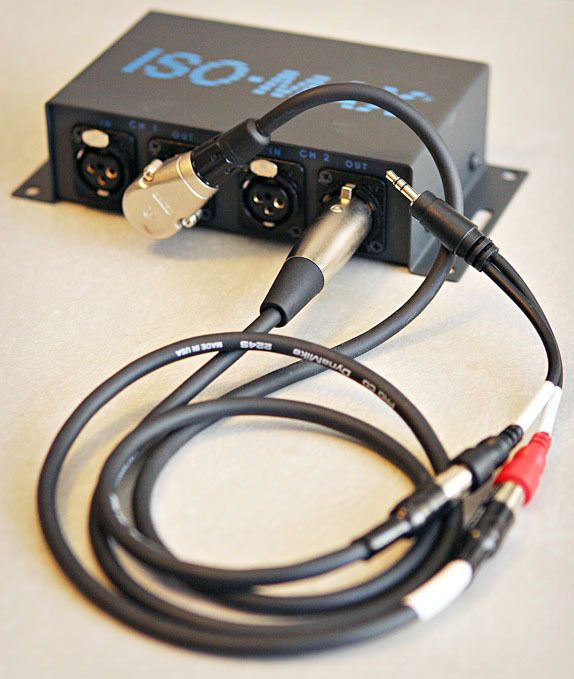 Here's a photo of my Jensen Iso-Max PI-2XX box with adaptor cables to 1/8" stereo miniplug, for the FX1 mic/line input. Here is the wiring inside the PI-2XX. To connect this box to the camera, I wired up the short XLR-RCA jumpers myself, since the commercial cables I found did not have the ground shield connecting XLR pin 1 to the RCA plug shield as specified in the Isomax user manual. Some people advise against transformers as they can add distortion or frequency rolloff, but this particular one is quite good. In this RMAA test I found it had essentially no measurable effect on audio signals. In fact this box is better than needed, given the quality of audio feeds at events I have recorded so far. For more convenient on-camera use, most people use a smaller XLR adaptor such as the under-camera Beachtek or belt-mount Studio-1. Note: in manual audio levels mode (both mic and line level) the FX1 has an always-active internal limiter which starts around -8 dB full-scale and limits the average recorded level to about -5 dB full-scale. I view the presence of this limiter (which cannot be switched off, as far as I know) as a good thing from a production standpoint, as it extends the useful dynamic range of the audio inputs by about 20 dB before severe clipping starts. However, it can complicate audio distortion testing. The built-in tape drive on the camera is convenient, but it occasionally has drop-outs (see also Sony's statement on dropouts.) Since HDV records in blocks of 0.5 second, a dropout gives you half a second of black video and muted audio. I consider this unacceptable in a professional environment. You can avoid tape drop outs by recording the HDV signal via firewire to an external hard disk drive. There are dedicated hard drives for the purpose, although currently most record only plain DV, and would require at least a firmware upgrade to accomodate HDV. You can also use a laptop or notebook PC with built-in or external USB2 or firewire drive. I know Vegas 6 and DV-Rack with the HDV add-on can record HDV, but there is a simpler alternative: a freely downloadable program called CAPDVHS (thanks John Jay at DVInfo for pointing this out.) CapDVHS was designed for D-VHS decks but it can capture MPEG-2 from any firewire source, including for example HDV cameras. It requires Windows XP. It works fine on my Dell Inspiron 9300, but does not work on my desktop WinXP box for unknown reasons (says "Error 80040217: Cannot connect SampleGrabber"). A freeware utility called HDV Split can read an entire tape from the FX1 and generate separate .m2t files based on the time/date stamp, so each take is a separate file. I find this very convenient. For simple editing of MPEG2 files directly, I find Womble MPEG Video Wizard to be convenient and much faster than Vegas 6.
mic input. I recorded in 44.1 kHz stereo, 320 kbps MP3 mode. Here's a quick audio sample, with the "Giant Squid Audio" lapel mic (downconverted to mono @ 128k for the web page). I hear a faint background buzz in the playback that reminds me of insects, maybe cicadas at night. Apparently this is digital noise from the unit. You can hear this noise clearly if you listen in headphones as you record: the noise starts as soon as you press "record" and stops when you stop recording. Here is an amplified clip with just the noise. With RMAA, I measured the iRiver FP890 to have a dynamic range of 69.8 dBa (ref -50 dBV input, mic level) and 86.3 dBa (-10 dBV input, line level), but the mic number may be optimistic as I believe the mics I would use "for real" have a higher output impedance than the attenuator I used for the mic measurement, hence more of the digital noise gets in. If I had a tiny battery-powered 40 dB preamp to make mic level into line level with negligible added noise, I'd be happy with the iRiver. Such a mic preamp IS possible; the Sony HiMD units provide an existence proof, so I don't know why such an item isn't widely available. As it is, the iRiver is just a bit more noisy than I'm comfortable with. You can see a few more audio details and graphs from the RMAA testing program on this page. As far as I know, the standard video editors like Sony Vegas do not provide a function to read out the time/date info stored as a data subcode in the HDV file and make them visible as a text overlay on the video. However, there is a way to do this using an Avisynth plugin called HDVInfo by HDVSplit author Paviko, along with DGIndex and a mpeg2 input filter. 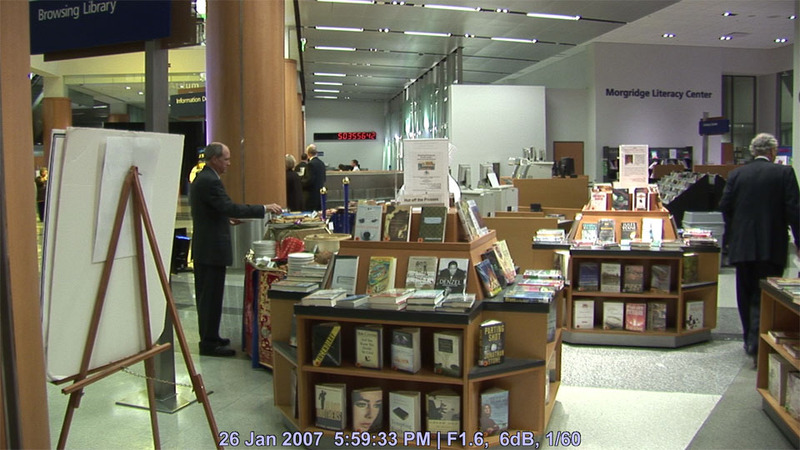 Here is an example frame showing the text overlaid along the bottom of the frame. Text font, size, color and format are adjustable from the avs script. Here is the avs file that generated the above example using AviSynth along with some plugins. In addition to AviSynth v 2.5 and the HDVInfo plugin, it requires DGIndex.exe and DGDecode.dll avisynth plugin, both from DGMPGDEC.